Listening to both west side streams at around 19:15 it seemed that the voice and pings were louder at Lime Kiln, though they could be heard after a few second delay at the Orcasound hydrophone. By 21:00 it seemed the signals were louder at Orcasound than at Lime Kiln. This suggests that the Navy submarine was moving northward up Haro Strait. Since we have only a single hydrophone at each node and node-to-node timing isn’t synchronized in the streams, it’s not possible to verify the direction of travel using arrival time differences. At 21:02 I made another recording from the Lime Kiln stream that contains two of the word sequences. Then I switched to recording the Orcasound stream. The voice was clearly audible for the next half hour and there were a few sonar pings interspersed. 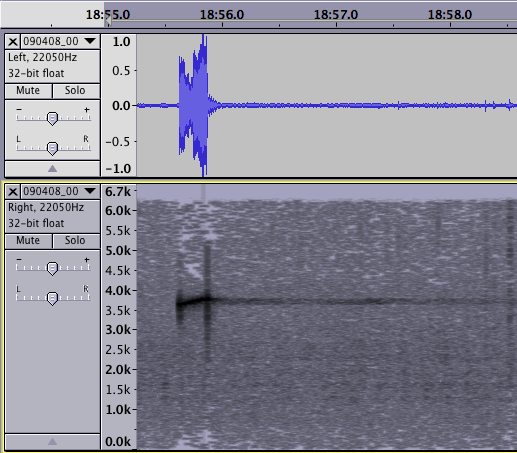 By 21:34 the voice was pretty faint and the last time it’s dectable in the sonogram (and by ear, very faintly) is around 10:05. 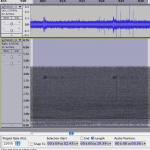 However, at about 21:59 the final recording caught a couple of unique pings (3.7-3.8kHz, 0.8 second) and their echoes ( 090407_2150_os_375khz-sonar ). The two pings were spaced 16 seconds apart and had a noticable echo at 3.67 seconds, equivalent to about 5.5 km. Assuming the echo was off the eastern wall of Haro Strait bathymetry (about 6km from Orcasound), the two-way travel time suggests the submarine was probably pretty close to the San Juan Island side of Haro Strait. The acoustic experience continued on past midnight. 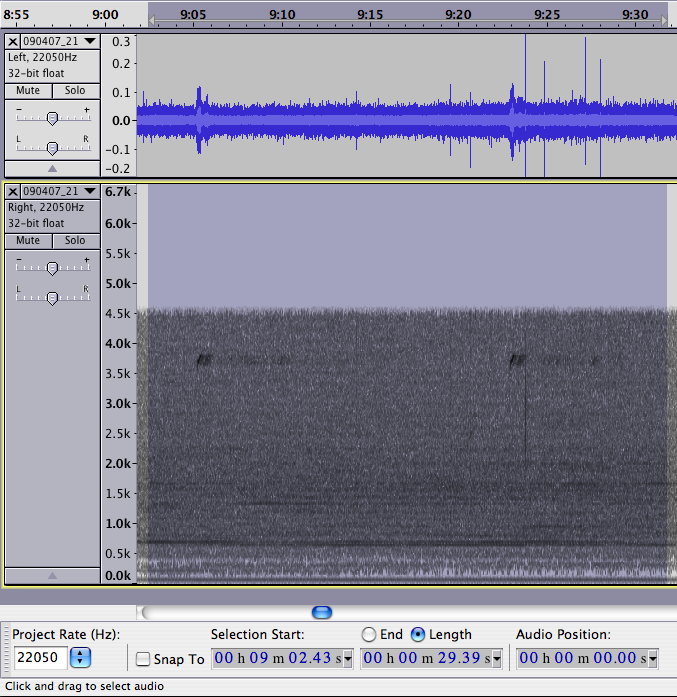 At 00:24:30 on 4/8/09 I heard a series of beeps (back at ~2.9 kHz) and then their echoes at Orcasound. At 00:30-00:32 I again recorded the voice along with tones and their echoes on the Lime Kiln stream. 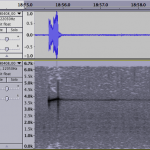 Around 00:40-00:45 I heard and recorded what sounded like a conversation, rather than the separated single words of the previous sequences. At 00:48:30 there was a very loud ping (close to Lime Kiln?) and either an echo or a ping from a separate, more distance location. This was followed by many repeated word sequences. At 01:00 things got quiet, but then at 01:11:00 there was suddently another impressive single ping (sound clip: 090408_0038_lk_single-375khz-ping ). At 01:13, the slow voice started repeating sequences again. Another single ping came at ~01:22 as two cargo ships came abeam of Lime Kiln and increased the ambient noise levels. 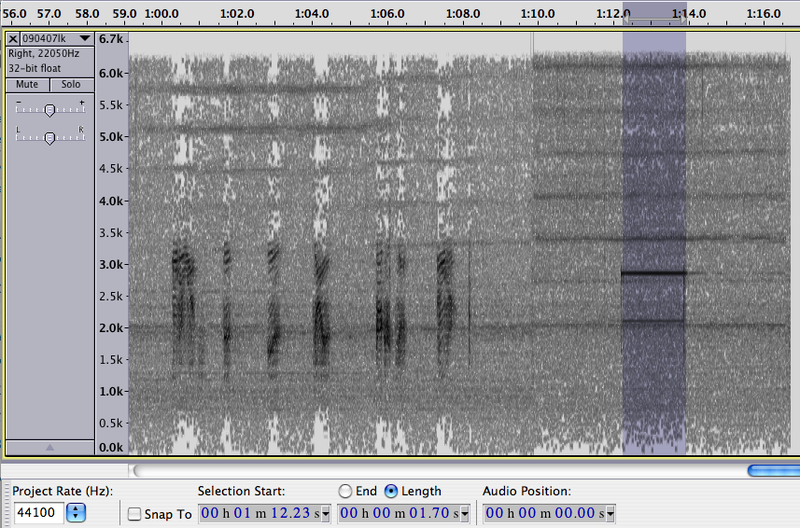 Another at 1:31:00 with a nice echo was followed by more conversing at 01:36. 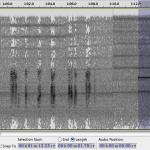 Then there was an extended sequence of sonar tones and verbal interjections that grew progressively fainter and then stopped ~01:45. Around 01:50 things picked up again with more conversation and then — most interestingly — what sounded like an exchange of longer tones, possibly between two sources, one near Lime Kiln and one substantially further away. After about 5 minutes of silence, there were two more loud pings with echoes at 02:00:45.